- George S. Patton, Jr.
After going through our activities since November 2010 when we began this project. We have experienced things many others have not. Instead of just putting facts and statistics on paper, we have been in contact with not only veterans, but veterans and their family members who flew with or knew Uncle Bob. Mrs. Bauman, who's husband's records were lost. 2. Met Hap Halloran and his family, and interviewed Robert Goldsworthy. Along with countless others. 3. Have received signed copies of books from B-29 veterans. 4. We both flew on FiFi! 5. Dedication of Dodge Challenger car "Reverence", to Uncle Bob and crew. 6. Made a pilgrimage to Kobe crash site/memorial. 7. Have made possible to our family and Capt. Ogata's daughter the facts of what occurred on that fateful night 70 years ago. 8. Last and most importantly, we have created a website that everyone says is as good or better than anything available. We are eternally grateful to our family and friends in research. We especially wish to thank the families and friends of all the honored veterans included on this page. Without their time of contribution and review, the site would not be what you see here today. We highly value all these truly fine people and their sacrifice and consider them honored friends. Z-8, "Mission to Albuquerque" shown here as a scale model replica of the ship our Uncle Bob was lost on. She was known to other aircrews as the "Saint Bernard" for always assisting other ships in distress during missions. Robert Dean Cookson was not born to become a radar operator, and from what we have been able to learn, never considered military service at all as a career. World leaders and events were forming that life for him and he didn't even know it, just like millions of other young people in America. Like millions of others, he perservered, made the best of what he had, and tried to enjoy everyday as best he could without complaint. That is what is so outstanding about that generation. They were honest, forthright, hard working people who dealt with difficulty, overcame it, and moved on, never asking for a hand out. Uncle Bob was the son of Russell and Gladys Cookson, the second of four children. His older brother Rich was born in 1920, Bob in 1922, sister Lois Eileen in 1924, and youngest sister Jane in 1928, in the small, rural town of Goshen, in Northeastern Ohio. Goshen was small. It had a couple of independent coal mines, a clay-pipe plant, a grocery store, and a couple hundred residents. Most of whom, like Uncle Bob's dad, worked in the coal mines, ran heavy equipment, worked in one of the local plants or mills, or farmed for their livelihood. They were depression era people, trying to make ends meet and provide for their families the best they could, with the resources available. They raised vegetable gardens, had fruit trees, and canned these items to store in the cellar. Many, when they could afford it, had chickens, pigs or cows, which they butchered. Nothing was wasted, and nothing was forsaken, yet everything was shared. It was a close knit community and no one was ignored. Uncle Bob grew up typical of youngsters in his day without money. They made their own fun. In the summer, they hiked in the woods, picked berries, built forts, swam and fished in the Tuscarawas River, and carved their initials in the rocks on Cookson Hill behind their house. In the fall, their passion was hunting rabbits and squirrels-for food, not for fun...both Bob and his brother Rich were crack shots. They would gather walnut and hickory nuts. In the winter, they would sled-ride or ski down over Goshen Hill, and try to ice-skate (usually without the skates), and try to find a warm place to gather. Spring time brought welcome relief and they were back in the woods seeking mushrooms, and enjoying the warmth of the outdoors again. Both boys loved the outdoors. Uncle Bob and his brother Rich spent a lot of time with their grandpa, Jimmy, who lived in a log cabin without electricity or plumbing down the dirt lane from their house. Grandpa Jimmy came to America in 1893 and was a coal miner. He was well educated, religious, and loved to listen to his radio that was hooked up to a car battery for power. The boys adored him and stayed there frequently, much to "Gramps" amusement. He enjoyed their company, and appreciated their companionship. Bob's brother Rich was almost universally known as "Hoss" because he would ride anything. Horses, mules, cows, it didn't matter. If he could get on it and control it, he rode it. Later in Rich's life, that passion turned to motorcycles, cars, and speed. Most people that knew him said they never saw anyone who could control a car the way he could. Not all was fun and games. Uncle Bob and his brother would seek out any kind of work they could get for any amount of money they could earn, just to have a few cents in their pocket. Mostly, they found work on local farms doing chores, making hay, or cutting and husking corn. That few cents they earned enabled them to buy some candy, go to a "picture show" up town, go roller skating or to the arcade at New Philadelphia Park. Maybe buy a new shirt or some pants. Simple, yet important. Uncle Bob graduated from Midvale High School in 1939, a proud moment in his life. But, not much promise for a good job as the country was still suffering the effects of the depression. He joined the National Youth Administration Camp, a work training program based on citizenship and need for youths between ages 16 and 25, that trained unemployed, out of school youths. It wasn't much, only 70 hours per month maximum, and $10.00 to $25.00 per month. But, he was working, and earning. He also met his future wife, Daisy Frances. Along the way, they had three beautiful children, Bob Jr., Carol, and Lois Jean. Luckily for Uncle Bob and his new wife, with children on the horizon, in March of 1941, he was hired on at Republic Steel in Massillion, Ohio. He was making a very good wage at that time (76 cents an hour), cutting plates-and was extremely thankful. His life had finally turned a corner in such a positive way, and he was happy. He and Daisy rented a house in Goshen, and even bought a 1936 Ford from his dad for $100.00. December 7, 1941, would alter the lives of our family forever. 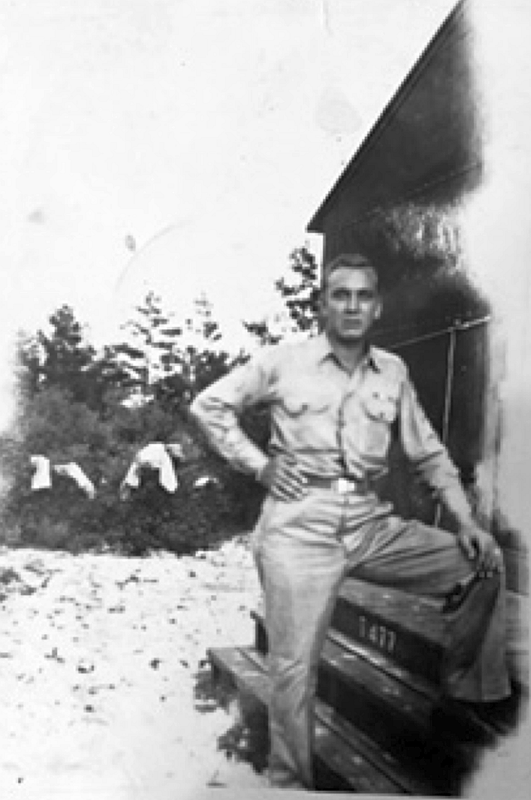 Uncle Bob was inducted into the Army in January of 1943, leaving his wife, young son and family behind. All with a second child on the way. I don't know what that feeling must have been like, to stand on a train moving away from the station watching your pregnant wife and little boy disappear in the distance behind you. The uncertainty filling your mind about what you were about to embark on, not knowing when you would see your loved ones again, or if you would see them again. It didn't matter. A job needed to be done, and he had to help see it through. Uncle Bob did that and much more. Living his life with dignity, and with a profound love of his family, he went off to war. With emotions that cannot be put into words, we dedicate this website to our Uncle Bob, with fondness for a man we never knew but who has captured our hearts. We can only imagine. We invite others to join us. We have made great efforts to ensure the accuracy of the content herein. If we have presented information regarding the 500th BG incorrectly or have you additional information on our Uncle Bob, please let us know via our Contact Us page. 9 January 1945. Uncle Bob wrote his mother that he felt his "chances don't look too bright" of making it home. "Some of our ships have been rammed by Japs and I don't like that at all. Especially, when we are the lead ship." 22 January 1945. Uncle Bob Wrote his mother, "We really blew up the plant and I don't think we'll have to go back there for a while. We had a few fighter attacks and some flak but only got one little hole in our ship. A lot sure goes through my mind though and I do a lot of wondering and worrying. NO future." 3 February 1945. Uncle Bob wrote his mother, "We have led a couple of raids already. Almost wasn't here to lead anymore as we came close to getting rammed." 17 March 1945. Our Uncle Bob was KIA when his B-29 was unintentionally rammed by a Japanese fighter. Fate took a cruel turn when his premonitions turned out to be true. 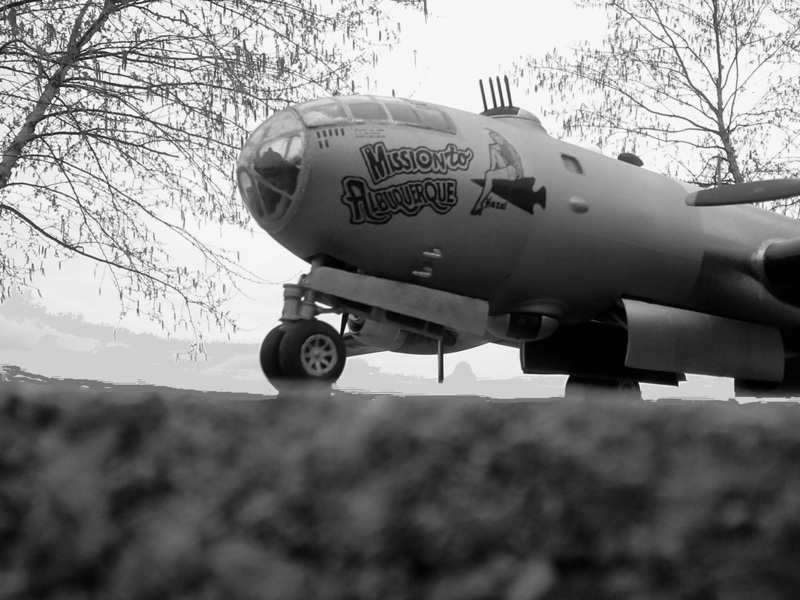 "The day your Uncle Bob saved us and our B-29"... according to Doug Bulloch. We were to fly a non-stop practice mission from Salinas, Kansas to Batiste, Cuba. On the return trip we ran into extremely bad storms and the formation was scattered "all over the place. Planes were landing anywhere they could due to the storms and fuel shortages." Flying Northwest towards Kansas, Captain Field come on the interphone and made the announcement that we were almost out of fuel, and we were to make preparations to "bail out." Upon approach, Capt. Field broke the rules and ignored the pleas from the control tower to get into a pattern. He made a bee-line for the runway and landed the plane safely. Thankfully he did so, because as they were taxiing the engines began to sputter and shut themselves down. They were out of fuel. Doug said that thanks to our Uncle Bob, "no one had to make their first parachute jump, the men were all safe, and the government saved $600,000.00."